Organizing an event can be quite an overwhelming task and you may need to hire vendors and contractors who offer their services to make events a success. However, while doing this, you may need to sign an agreement with the party concerned to ensure that you and the vendor think on the same line and there are no last minute confusions and hassles. 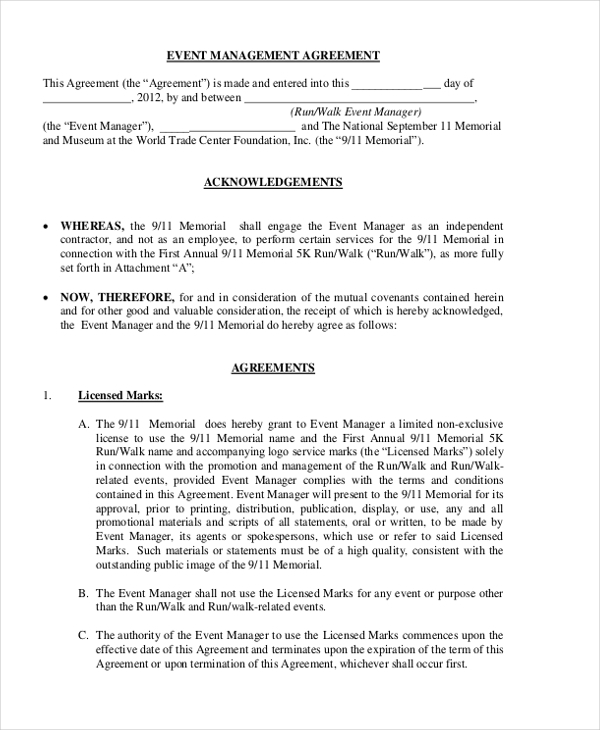 It is for such agreements that the event agreement form is used. You may also Event Registration Forms. 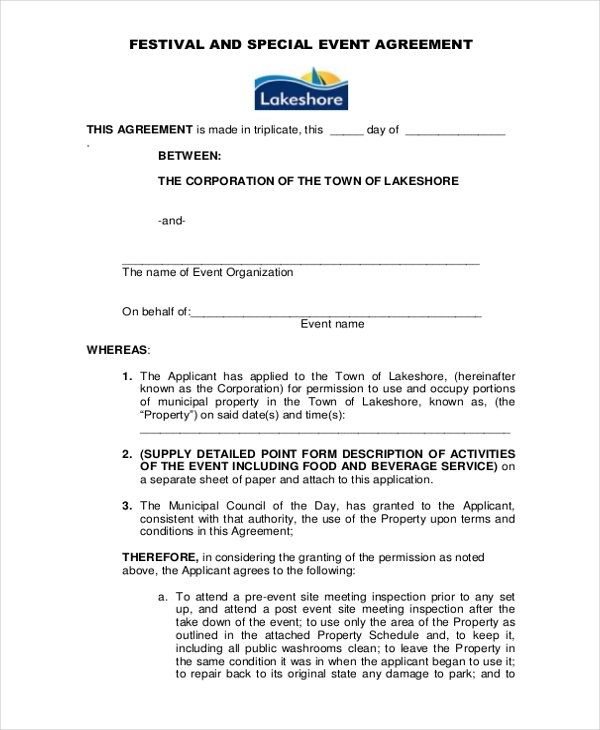 This form is used by a vendor or contractor who may have agreed to be a part of a community event. By using this form, the contractor signs a legal agreement with the party binding them to certain terms. 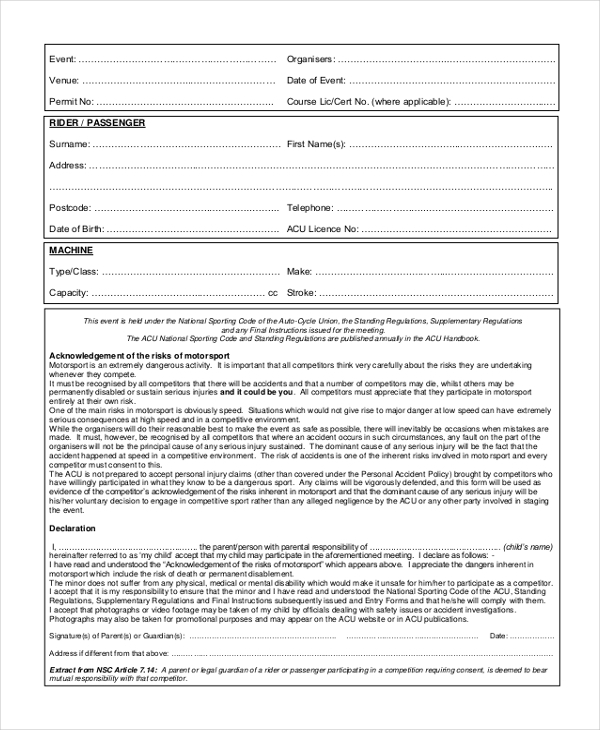 This form is usually used by a non-government organization that may be inviting individuals and social groups to help them in their fund-raising events. The form binds the two parties under certain regulations that both parties need to follow. Whenever an organization plans to organize a special event for collecting donations or creating awareness, it uses such a form to get into a legal agreement with the contractors helping them to organize the event. 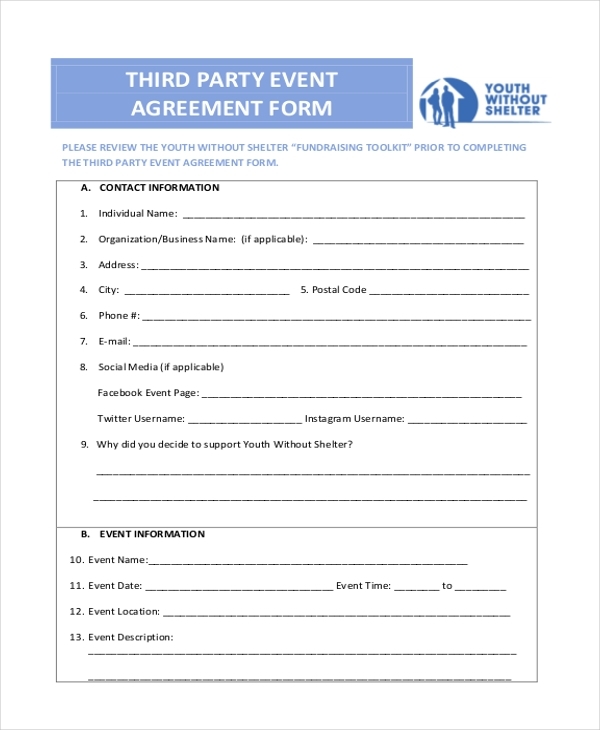 This form is used by organizations that may be hosting a special event for children. They use this form to get consent and enter into an agreement with the parents to ensure that both parties adhere to certain predefined terms. 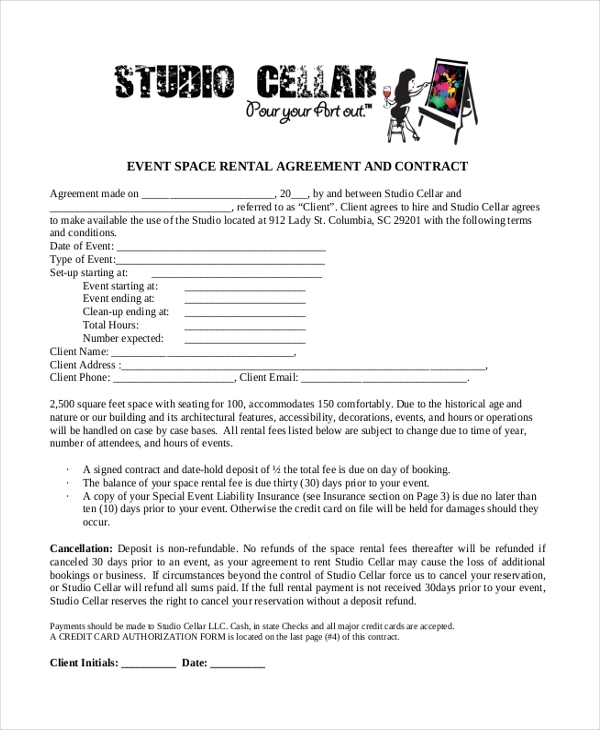 A person who may be willing to rent out his space to an organization for a particular event uses this form to enter into an agreement with the party. By signing this agreement, the two parties are bound legally. 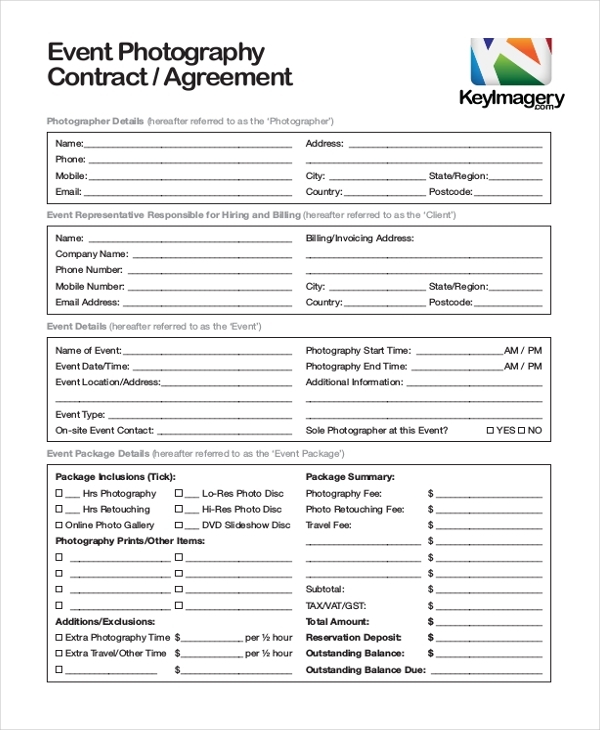 A company hiring a photographer to cover its event will use this form to get into a legal agreement with him. The form comprises of various terms and rules that both parties need to adhere to. 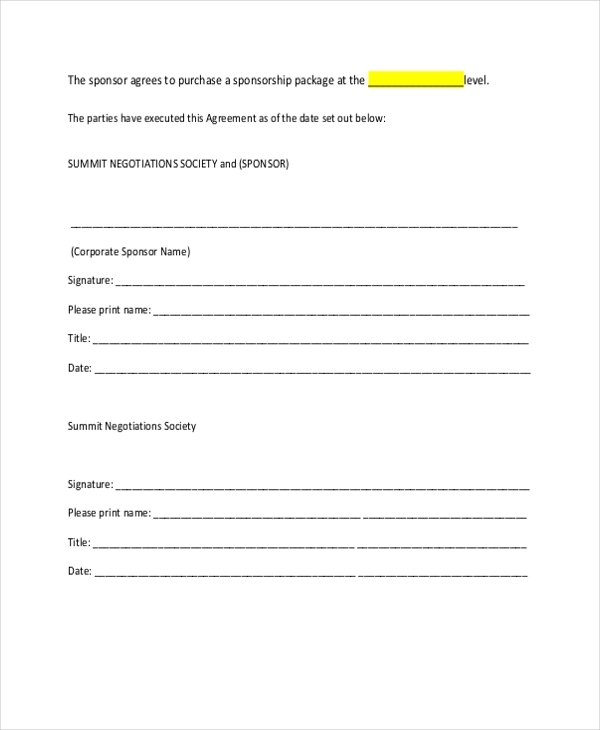 This form is used by an organization planning an event to get into an agreement with a person/organization who may have agreed to sponsor the event. The form comprises of the terms of sponsorship. Used by an event organizer to get into a legal contract with an event management firm, this form comprises of various regulations and terms that both the parties need to adhere to. When two or more parties plan to organize an event together, they use this form to predefine certain rules and terms of the partnership that would ensure a smooth coordination between them. 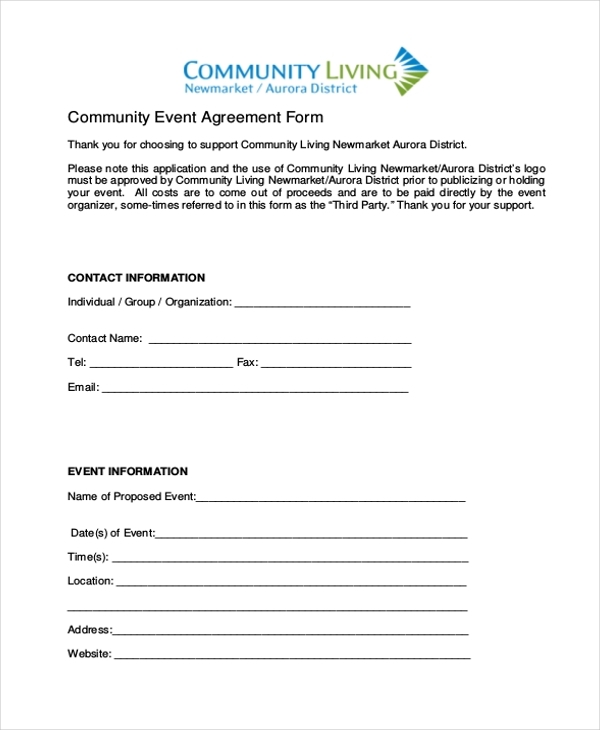 This form is used by a community or committee that may be planning to organize an event. It asks its contractors and vendors to sign this form with certain regulations that they need to follow. Who Should Use an Event Agreement Form? An event agreement form is a legal agreement that binds two parties in a legal contract and spells out regulations and terms that both the parties should follow. 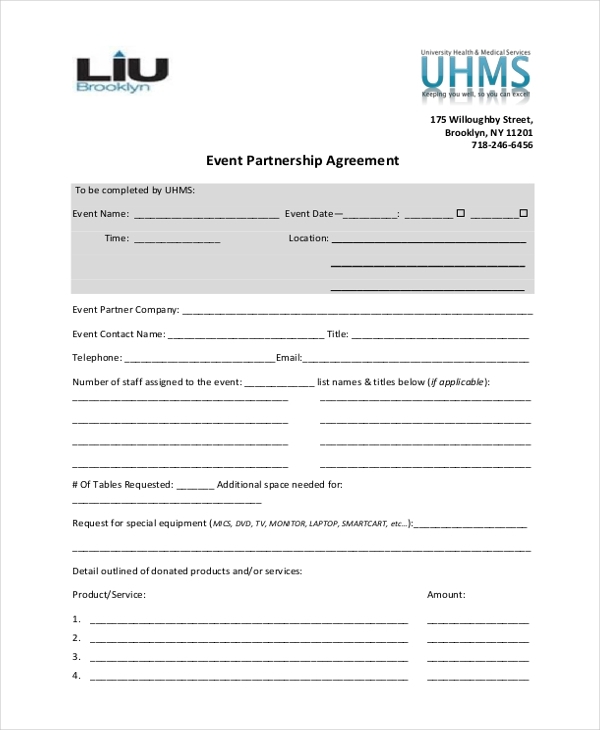 Thus, an event agreement form can be used by any person or organization planning to organize an event or offers his services to various events. Be it an event management organization, a community center, a contractor or vendor or a company, anyone who wants to organize a hassle free event should use this form. Useful Event Feedback Forms. What are the Benefits of Using an Event Agreement Form? There are a number of benefits of using an event agreement form. The form allows the two parties to spell out the terms and conditions that both of them need to adhere without fail. The form comprises of all the details of the event and the services offered which ensure that there would be no last minute hiccups. The form acts as a legal document and can be used as a viable proof in case of legal issues. How Can One Draft an Event Agreement Form? An event agreement form is a legal document and hence should be drafted with utmost care. Before drafting the form, it would be a good idea to consult both the parties to find out the terms that they want to add to the document. Break down the content into small readable paragraphs or bullet points. Place segments where the parties can enter their details and signatures. You can also see Event Management Forms. 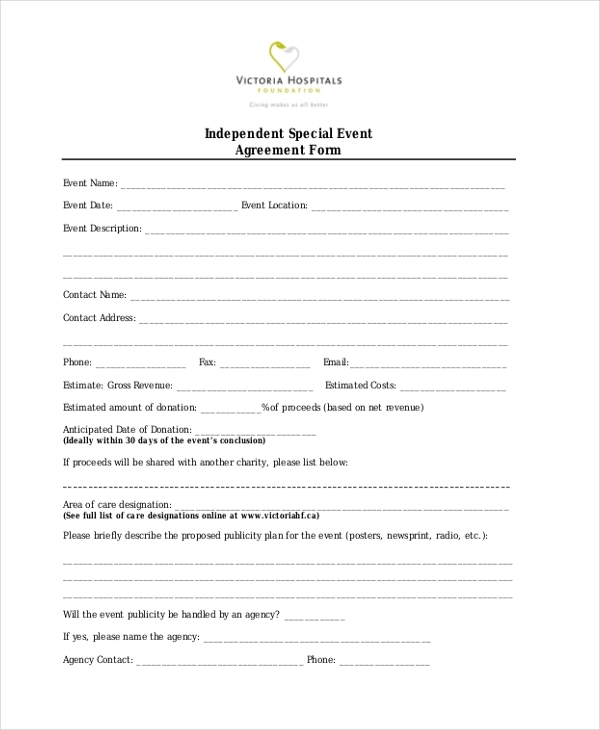 Designing an event agreement form can be a harrowing task and is better done by experts. However, if you do not have enough time to hire one, you can find these forms on-line. Just look for the one that is perfect for you and customize it as per your requirement.